FONATANA, Calif. (September 21, 2003) - In what would be his final victory in the Pennzoil Panther No. 4 Chevrolet, Sam Hornish Jr. kept himself in contention for a third consecutive series title after he won the Toyota Indy 400 Sept. 21, 2003 at California Speedway. The Toyota Indy 400 established a new closed-course speed record with an average race speed of 207.151 mph, eclipsing the previous record of 197.995 set during a 500-mile CART event at California Speedway in 2002. The previous IRL IndyCar Series record was 197.897 mph set at Kentucky in 2003. Hornish also won that event. It was Hornish's third victory of the season. He also won at Kentucky and Chicagoland. 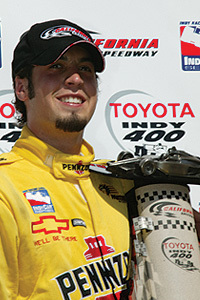 For Hornish, 24 at the time, the win earned him a record 11 career IndyCar Series wins. Scott Dixon finished second in the No. 9 Target Chip Ganassi Racing Panoz G Force/Toyota/Firestone, followed by Tony Kanaan in the No. 11 Team 7-Eleven Dallara/Honda/Firestone. "I could run wherever I wanted to, and that was the big key today," Hornish said. "We definitely didn't have the fastest car, but we had the car that could run wherever. It was just a great day for us. "The guys really worked together. With all the green flag stops that we had, it was really important to get us in and out quick. They gained us positions every time we went (into the pits), so we're pretty happy about that." Hornish's victory propelled him to fourth in the point standings, just 19 points behind Dixon and Helio Castroneves, who were tied for the points lead. "Things are still up in the air," Dixon said. "Everybody is going to be pushing towards the end. It's going to be tough. There are five guys in (the championship hunt). It's going to be tough no matter what." Kanaan's third-place finish put him third in the championship standings with 460 points. "We didn't have it quite at the end, but the whole 7-Eleven team did a great job," Kanaan said. "I need to thank Honda. Honda has kept up their game and gave me a great engine. Two more weeks to work on the engine, two more weeks to work on the car, and we'll get it. We'll get them in Texas." Rookie Dan Wheldon finished fourth, tying a career best, in the No. 26 Klein Tools/Jim Beam Dallara/Honda/Firestone. Tomas Scheckter rounded out the top five in the No. 10 Target Chip Ganassi Racing Panoz G Force/Toyota/Firestone. Pole sitter Helio Castroneves finished sixth in the No. 3 Marlboro Team Penske Dallara/Toyota/Firestone and is tied with Scott Dixon for the championship lead. Castroneves and Dixon lead Kanaan 467-460 in the point standings, followed by Hornish at 448 and Gil de Ferran at 437. All five drivers remain in contention for the IndyCar Series Championship. The race was slowed only once due to caution, tying an IndyCar Series record that was set in August at Kentucky.